The largest collection of Monet's works and memories : 87 paintings and drawings. The famous Impression Sunrise which gave the movement its name. Photographs, portraits Monet made of his children, 2 palettes he used, etc. Monet's masterpiece "Les décorations des Nympheas" that he gifted to the State to celebrate 1918 victory. The paintings are displayed in two oval rooms especially designed for them. The museum closest to Giverny. Two paintings given by Monet himself to the town, including a rare circular Nympheas. 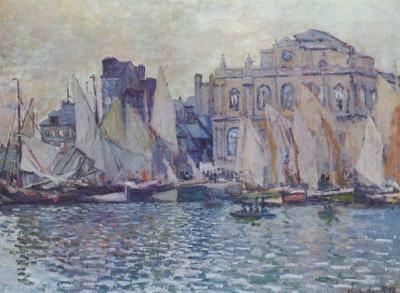 "Cathédrale de Rouen", "Jour de fête rue Saint Denis", etc.